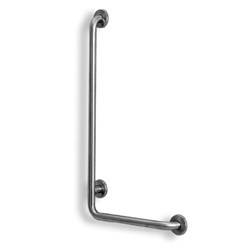 ADA L-Shaped grab bar made of seamless stainless steel AISI 304 pipe with a satin finish. SATIN-STAINLESS STEEL Series L-shaped grab bars are made of seamless stainless steel AISI 304 pipe with a satin finish. The L-shaped safety supports are 1-1/4” in diameter and have a clear space between the wall and bar of 1-1/2”. 16”W x 32”H available in right and left configurations. ADA compliant. Please allow 1-2 day lead time.